Skunks are mischievous, wild critters often making a home under decks, inside barns and rummaging through garbage cans. A cousin of the weasel, skunks are roughly the size of a cat with black and white fur and a long, feathered tail. 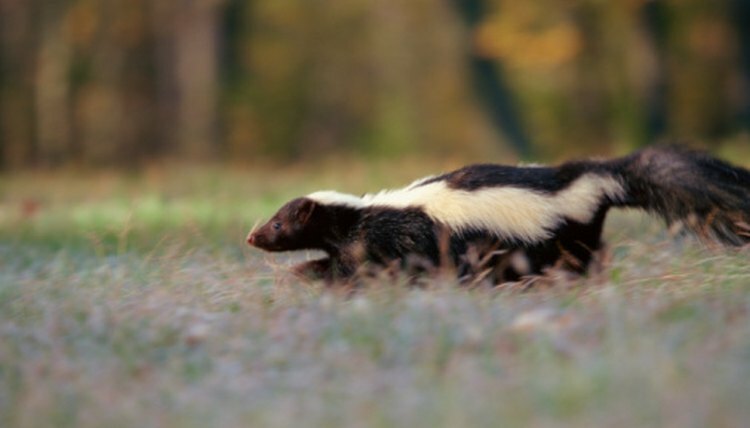 Skunks spray a putrid chemical aroma as a defensive mechanism that can stain your clothes as well as the skin of pets and animals. Smoking out a skunk is a straightforward task if you employ certain steps to ensure success. Tear a pile of old towels of tee shirts into 4-by-12-inch sections. Dunk the towels in ammonia so the entire face of the fabric is saturated.Tie the towels into balls and toss them under decks, porches and into foundation holes where skunks may enter or exit. Ammonia will cause the skunk to asphyxiate and be forced to abandon the premises. Use discretion when choosing how many towels you need. The amount of towels you utilize -- as with the other objects needed -- depends on the severity of your problem. Slice handfuls of citrus peels -- lemon and orange, for example. Drop the peels around the perimeter of your garage or barn to detract skunks. Intensify the citrus aroma by placing peels on the interior and exterior side of the walls, as necessary. Skunks do not favor the smell of citrus and will avoid it at all costs. Fill a spray bottle full of dog urine. Squirt the urine around the perimeter of typical skunk hiding spots to repel or force the animal away from the area. Light a fire in your backyard. Use a burn barrel or ignite a burn pile to illuminate your yard and add concentrations of heat and smoke. Skunks will instinctively retreat as far away from light as possible given their nocturnal nature. Fill a garbage can with poultry, eggs and dead mice. Chicken, eggs and mice are essential parts of the skunk diet and the scent of this trio will lure skunks out from their hiding place. Take note that while this may entice skunks hiding under steps and sheds to come out into the open, it may also attract additional skunks. Place poultry, eggs or dead mice into a skunk trap. Position the trap in a convenient location -- away from where children play but near to where skunks normally congregate. Dose the trail leading up to the trap with flour. Check the trap at night every 60 minutes to see if skunk prints are evident in the flour -- an indication that the bait is or is not working. Add additional bait as needed to smoke the skunk out of its hiding place and lure it into the trap. Purchase a skunk trap online or at any local home improvement store.